Sri Lanka’s historic craft traditions are set to go high-tech while the craftsmen themselves are to receive international craft exposure. The country’s national crafts expo series has for the first time expanded to include SAARC region’s arts and crafts. “It is time we bring in new technologies to this sector. Together with the Ministry of Telecommunication and Digital Infrastructure, we are planning to introduce new tech to the Sri Lankan crafts sector,” said Prime Minister Ranil Wickremesinghe, addressing the inauguration event of Shilpa Abhimani – 2016 Presidential Awards and Handicrafts Exhibition by the National Crafts Council (NCC) of the Ministry of Industry and Commerce at BMICH on 17 November. The high-level crafts and arts expo by the NCC is aimed at uplifting the quality of Sri Lanka’s craftsmen and their produce. Taking part at this year’s event – along with 100 Lankan exhibitors – are 30 visiting craftsmen from SAARC countries of Bangladesh, Bhutan and Nepal. Joining the inauguration event were Minister of Industry and Commerce Rishad Bathiudeen, Minister of Primary Industries Daya Gamage, State Minister of Industry and Commerce Champika Premadasa and NCC Chairperson Heshani Bogollagama among others as well as some members of the diplomatic community in Colombo. “Not every Sri Lankan completes their higher education in full and many of them want to take up other avenues of skilled livelihood such as arts and crafts. We need to provide a permanent income to present and future Sri Lankan craftsmen. 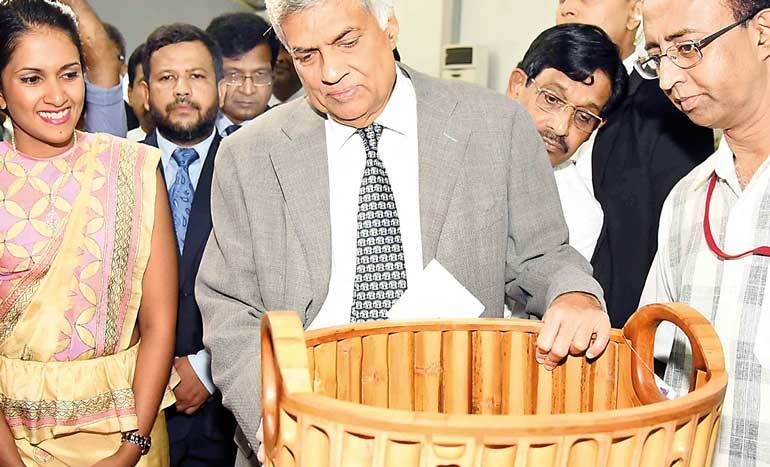 We want to modernise this sector as well,” said Wickremesinghe. Technology is increasingly becoming part of global designs and crafts, he noted. “I am not just talking about computerisation, laptops and smartphones here. I am talking about such technologies as 3D printing and laser-operated design setups for us to make the craftsmen up to date and take them to global design and delivery levels. With the strong reform vision of the Unity Government of President Maithripala Sirisena and Prime Minister Ranil Wickremesinghe I have no doubts that this can become a reality,” added Bathiudeen, stressing on the sector’s ability support the Government’s one million employment program. The organisers expect more than 30,000 participants to the Shilpa Abhimani show that concludes on 20 November at BMICH.